Take a video tour of this "spite house" that is squeezed tight on North End's Hull Street. A look inside Boston's Skinny House, built in the 1800's out of spite. Sandwiched between two brick and mortar buildings in Boston's North End is the city's famous “Skinny House,” a structure built on betrayal and spite. The 1,166-square-foot home at 44 Hull Street was sold in May to an anonymous buyer for $900,000. The new resident now lives in a piece of Boston history, albeit cramped and not ideal for too much company. The property is said to have belonged to two brothers who inherited land from their father in the 1800’s. However, when one of the brothers was away fighting in the Civil War, the other sibling built a large home on the property, taking up more than his share of land. When the other brother returned to find his share of the land invaded, out of spite, he decided to squeeze in an adjacent house, blocking this brother's views and sunlight. The “spite house” has no front door. Guests enter the home through a side door that resembles a window. It boasts four floors that are less than 300 square feet each. It has all of the amenities of a normal home, just much, much more compact. Most furniture cannot fit in the building due to the tiny space allotted between the walls and stairs. However, this unique home packs a lot into a small amount of space. All of the furniture and household needs fit snugly into the nooks and crannies of the Skinny House. It does have a surprisingly spacious backyard for a North End dwelling, and the roof deck shows off some great views. 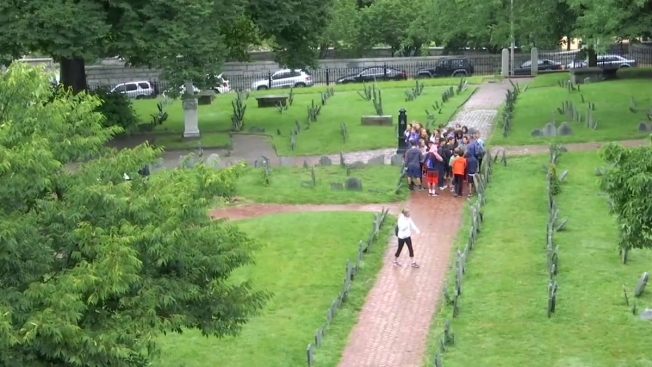 NBC Boston took a tour of this historic dwelling with a representative of the anonymous buyer so you can see this charming attraction for yourself.